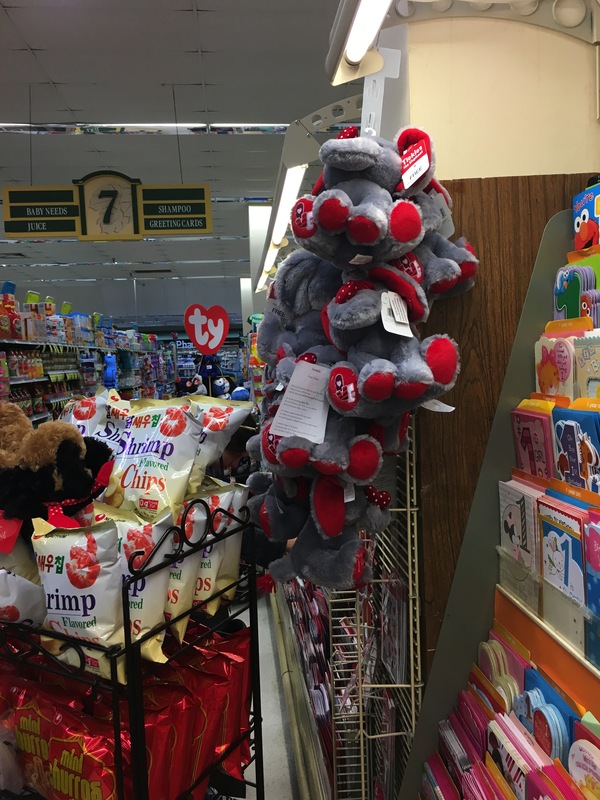 The sixth annual Poem Elf Valentine’s Day Poem Blitz ran into some glitches this year, which is why it’s arriving so late. 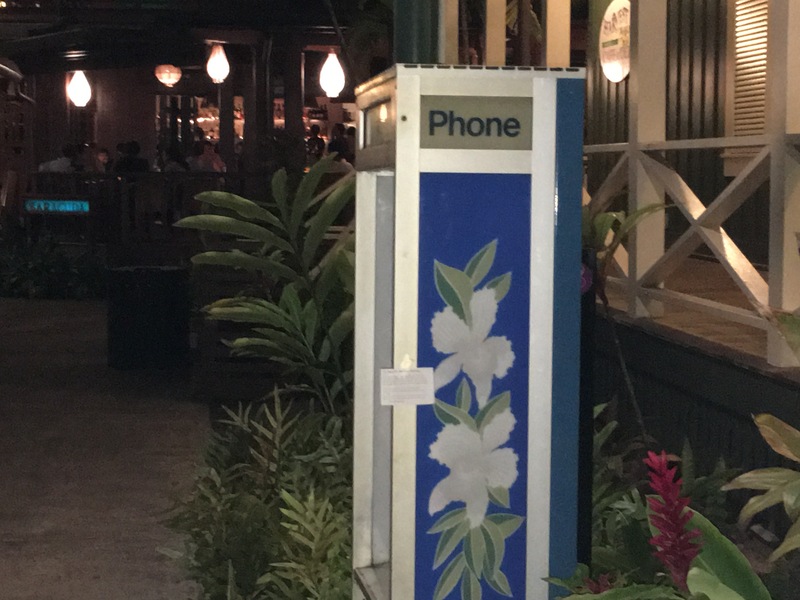 I knew it was going to be a few hours late because I’m on Hawaii time, but I didn’t expect (who does) to wake up on Valentine’s Day and discover my purse was stolen. I had to spend a few hours with the police and the credit card companies instead of on this post. I can’t complain because, well, Hawaii. Also because my son found my purse in the bushes up the street and the dumb kids who broke in only took my money and not my credit cards, license, favorite lipstick, or prescription sunglasses. Anyway, the show must go on. 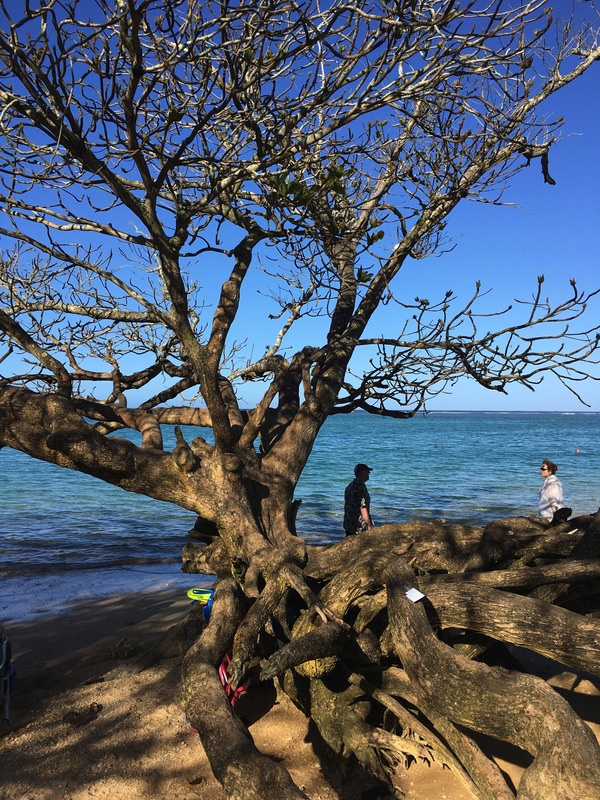 I’m without my own valentine this Valentine’s Day—he’s travelling in Asia–but his absence doesn’t dim my enthusiasm for my favorite holiday. Forget about chocolates and roses and candlelight—it’s a great day stripped of all that, a day to celebrate love in all its forms and manifestations. After all, what other holiday is dedicated to one single emotion? 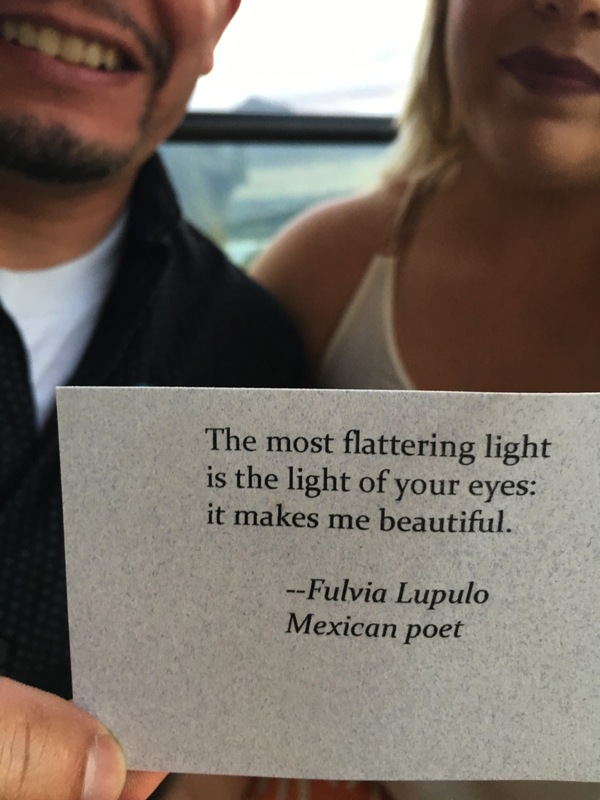 Let’s start with a poem I’ve posted before (at my niece’s wedding). 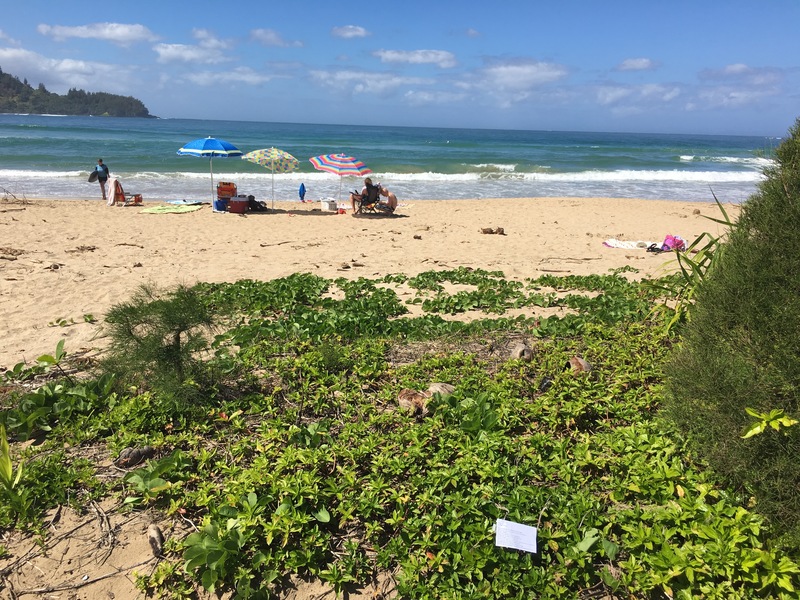 Fulvia Lupulo’s poem was just the thing to leave at a fancy hotel where couples go to canoodle and watch the sun set over the spectacular Hanalei Bay. 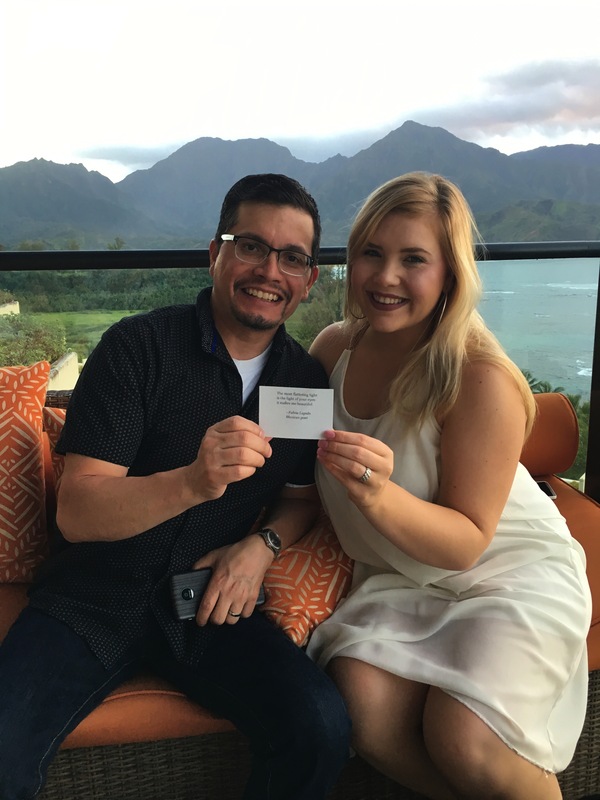 This couple from Seattle was celebrating their third anniversary. Look how happy they are! You don’t need to have a romantic partner to understand that being loved is transformational. 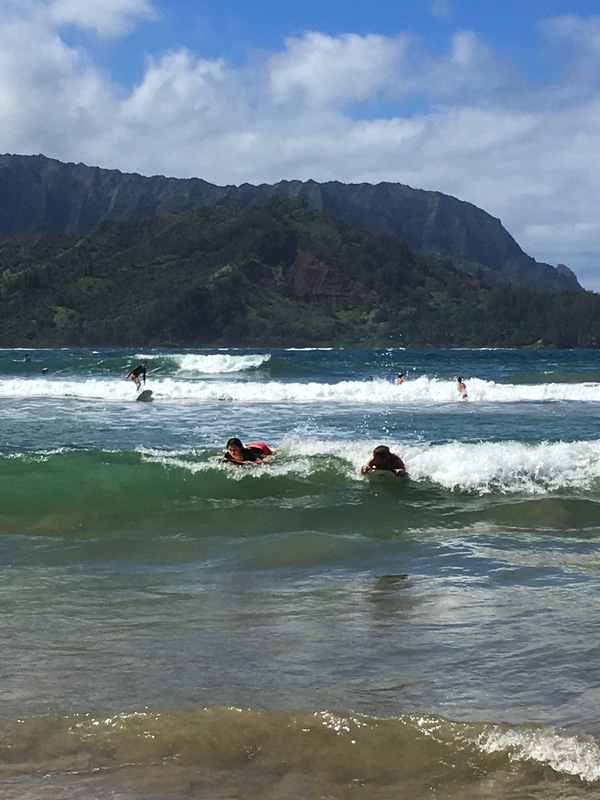 Honeymooners and babymooners (something I only recently heard of) are everywhere here in Hanalei, but I also see a lot of long-married couples. 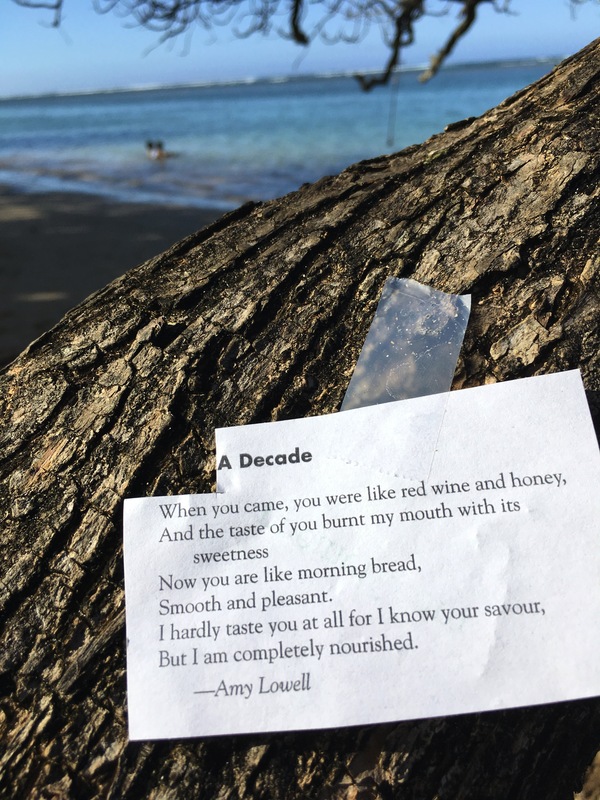 For them I taped “A Decade” by Amy Lowell (1874-1925) on a tree much older than that. The ease of these older couples as they walk the beach or wade into the surf together is a delight to watch. Less red wine and honey and more morning bread. 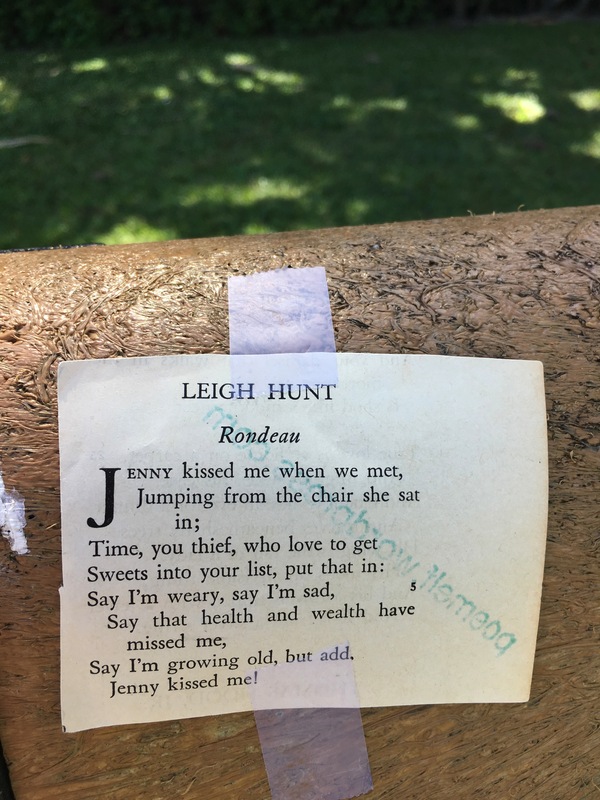 Here’s one for brand-new Valentines, “Rondeau” by Leigh Hunt (1784-1859). 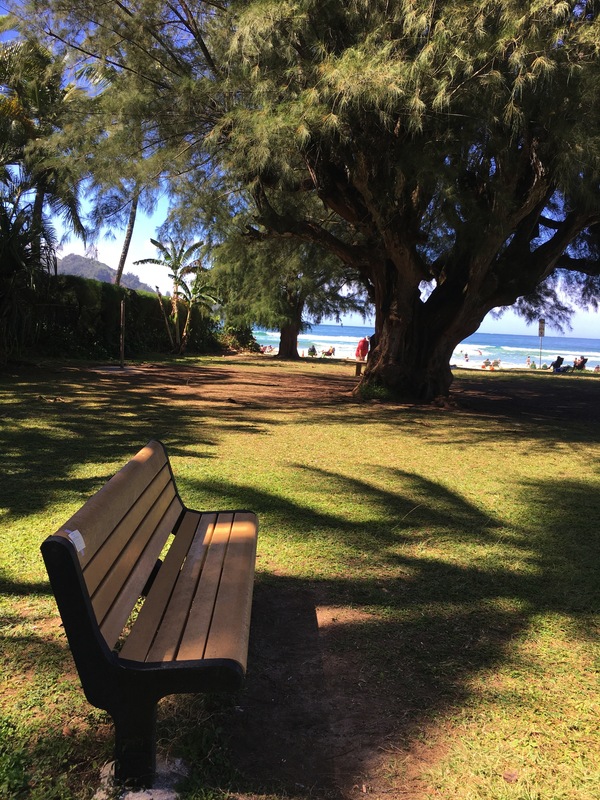 I taped it to a park bench under a tree on the beach, just right for a first kiss. Hunt’s poem is a sweet reminder of the thrill of that first contact. Galentines is a thing these days, not a typo, a day (the day before Valentine’s Day, actually) to celebrate friendship. 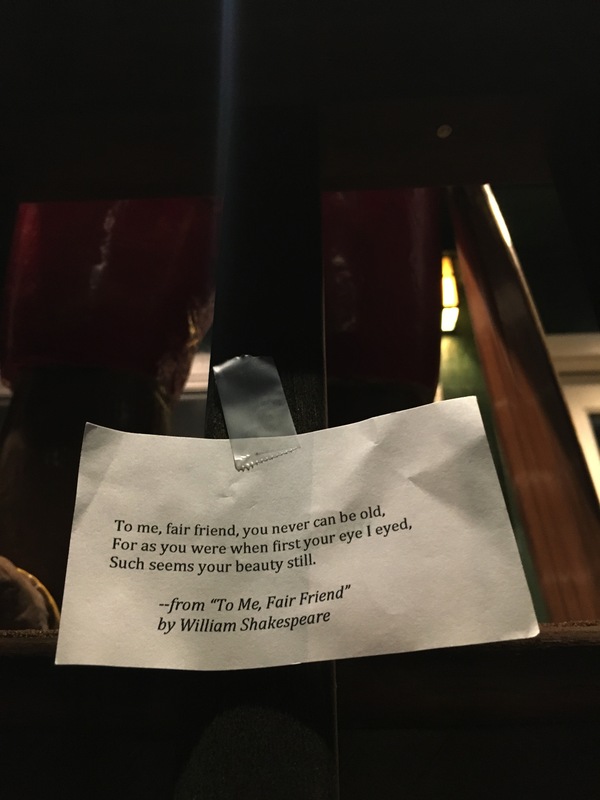 I’m changing it to Palentines so men are included, and so for all pals I left an excerpt from Shakespeare’s “To Me, Fair Friend” under a wooden statue of an old surfer in Hanalei Town. 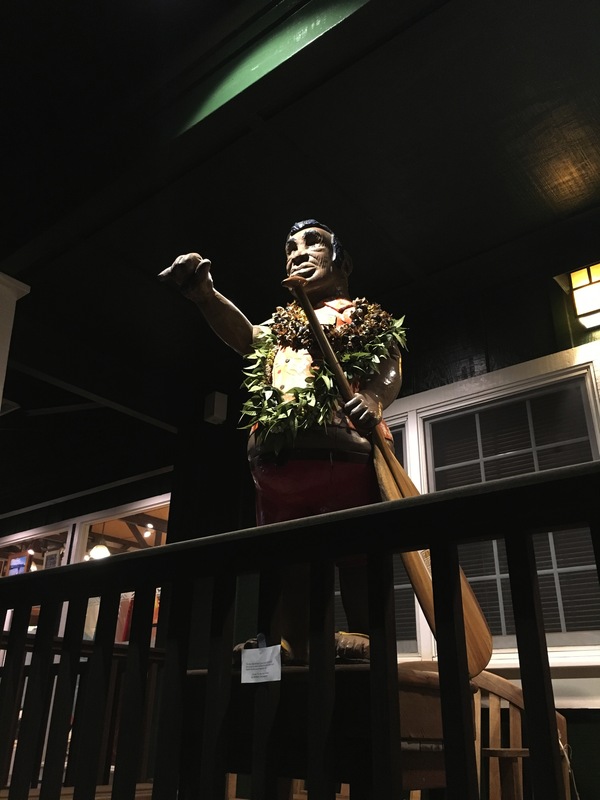 The surfer is making the shaka sign, a friendly greeting made popular by surfers and Hawaiians. The gray-haired, wrinkle-chested surfers you meet around here truly are, in dress and demeanor, ageless. Boys by any measure of the spirit. 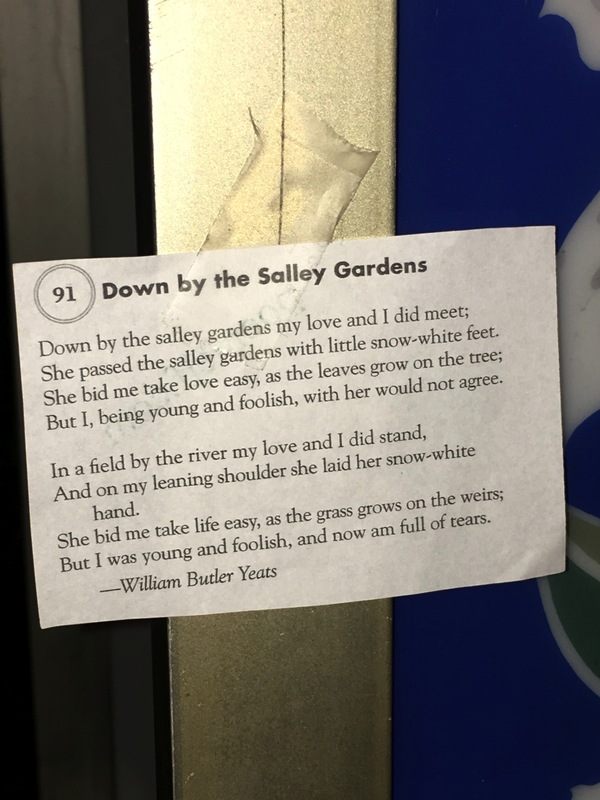 For those who find Valentines Day painful, I taped William Butler Yeats (1865-1939) “Down by the Salley Gardens” on a flowery phone booth right outside a lively bar where couples are busy coupling. Yeats is the poster boy for unrequited love. He courted Maud Gonne for thirty years and it all came to this: But I was young and foolish, and now am full of tears. 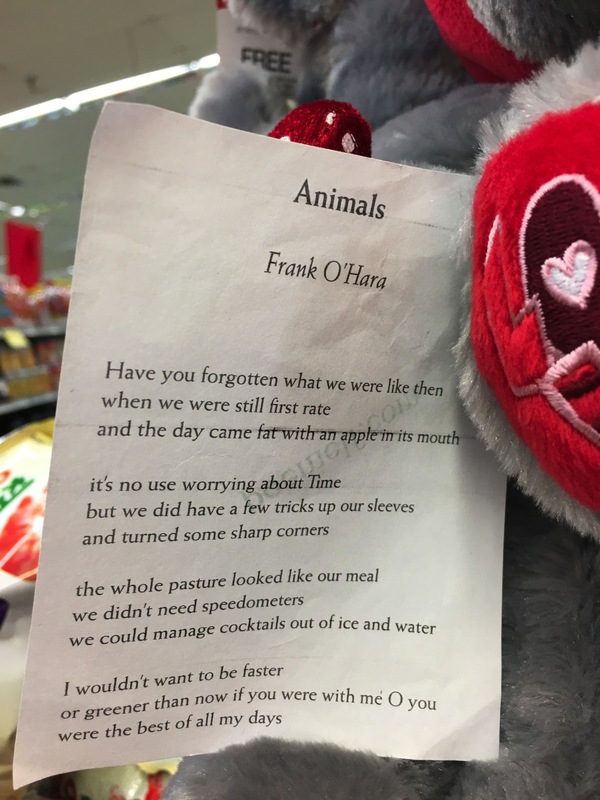 For break-ups that are more bittersweet than heartbreaking, I present this Frank O’Hara poem (1926-1966), “Animals.” I wedged it in a display of Valentine animals of unknown species in the grocery store. 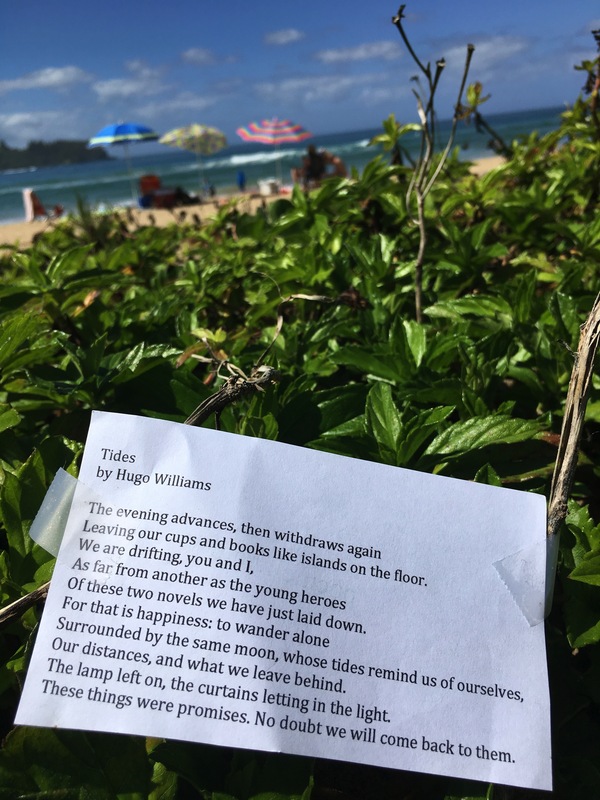 For my own Valentine, who wakes up today on the opposite side of the Pacific, I taped “Tides” by Hugo Williams (b. 1942) to some twigs and stuck it in the sand at high tide. That’s it! Happy Valentine’s Day, everyone! Or Happy Day-After Valentine’s Day if that’s what it is by the time you read this! And yes, Happy Valentine’s day even to the punks who stole my money—may you find the love that heals whatever ails you. And a happy Valentine’s Day to you, too, O Elfin One! Love your selections and the photos with them. Am now watching the ultimate love story–Emily Bronte’s Wuthering Heights–still one of my favorite stories. Tom Hardy is Heathcliff–wow! Very beautiful post, thank you so much for taking the time to pass along your sweet random gifts. Perfect selections. Keep doing what you do please. One of those poems looks familiar!! On grandmas end table in our living room 🙂 frame is from Africa. happy Valentine’s Day! Would love to see a picture of the cartoons and poems in the neighborhood. Looking forward to hearing from you again. Thank you Poem Elf, I will send you some pictures.. The excerpt is from Celie’s first letter to her sister Nettie in Africa. Having only just discovered that Nettie is alive, Celie has been able to read for the first time Nettie’s many letters to her, written during the preceding years and kept hidden. (Celie is by this time in her life running her very successful ‘Folkspants’ company. “…Nettie, I am making some pants for you to beat the heat in Africa. Soft, white, thin. Drawstring waist. You won’t ever have to feel too hot and overdress again. I plan to make them by hand. Every stitch I sew will be a kiss. and I tell him about you. ‘…For this all Nature slows and sings.’ (Big Sigh). How wonderful is that line? Neither in kisses nor caress. By trust and by respect and awe. These are the words I’m feeling for. Two people, yes, two lasting friends.